Oscar Bravo Home: Design Inspiration - Open Concept Living / Lexmod Furniture - Plus, a chance to win your own "Pyramid" armchair from Lexmod! 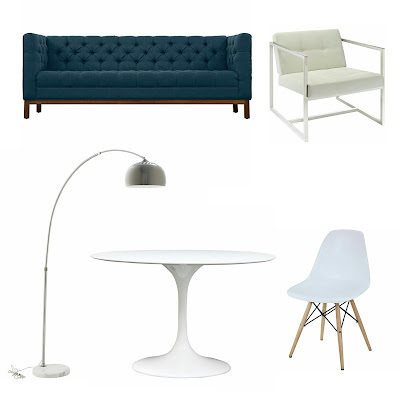 Design Inspiration - Open Concept Living / Lexmod Furniture - Plus, a chance to win your own "Pyramid" armchair from Lexmod! I love getting inspiration from interiors I come across in magazines, pinterest (you know you do too) or just cruising the web. My aesthetic usually remains the same: a bit earthy, definitely eclectic, with a little mid-century modern thrown in the mix. I pull many of my ideas through color. Any of you relate? My latest inspiration came from this awesome picture of the Homee Headquarters. HOW COOL IS THIS OPEN-CONCEPT OFFICE SPACE?! I was asked by my friends at Lexmod Furniture to create and share a mood board using their furniture and inspired by open-concept living. I thought this image of an open-concept office was great! I am going to share with you how I styled Lexmod's furniture with accessories and art inspired by the colors in Homee headquarters! PLUS! 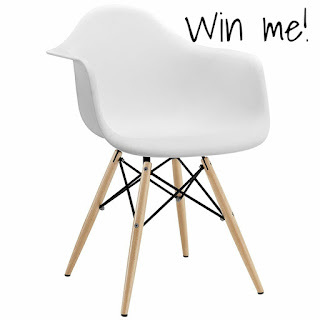 You have a chance to win a free "Pyramid" armchair! Link at the end of this post!! I took cues from the blue sofa and the small pops of red on the ping-pong table to create my color scheme. I used the same style of furniture that Homee headquarters used in their open-concept office. I created a bright, fun and eclectic look with these versatile furniture pieces from Lexmod that would really work with many different styles; open-concept or not! Now to show you the final look! A modern, eclectic style with red and blue accents! See anything you like? Shop my mood board above by clicking on what you're interested in to go directly to the website! Super easy, right? Thanks for visiting! As I promised, here is the link for your chance to win a "Pyramid" armchair in white from Lexmod Furniture! Click on the image below to enter the drawing!